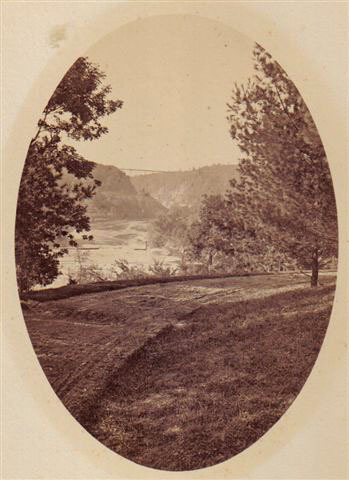 This peaceful view shows a road on Mr. Letchworth's Glen Iris Estate with the Portage Iron Bridge in the distance. Although the exact date is not known, we believe it was taken a few years after the bridge was finished during the summer of 1875. Some remnants of the mill dam that once stood in the river is visible in the middle left portion of the image. The road appears to be the one leading from the main estate gates (near present day Pinewood Lodge) down to the Glen Iris. It is is interesting to note the lack of stone walls. Many of Mr. Letchworth's roads had (and still have!) stone walls along them. This one, however, does not. We recently received confirmation of our identification of the road as being the more westerly of the two modern roads from our friend and Park history expert, Ted Bartlett. Ted writes "
"This view is the curve of the road down from the gates area (now the lodge area.) Mr. Letchworth changed the access to Glen Iris in the late 1870s or early 1880s and cut and filled this curved rive at the edge of the drop off in front of the present lodge parking area. Glen Iris is just around the corner to the right; the road pretty much is in the same location still. The whole roadway change, including the roadway to the middle fall area (below this image on the left) had engineering surbeys for topography and lay of the land at that time. The park still has the surveys that show the recommended placement of the roadway. This was all in connection with the relocation of the entrance gates up the hill, I would imagine for more privacy."